The Lincoln’s Legacy teaching module will take place over the course of thirteen sessions, taught in eight 60-minute and five 90-minute lessons. Through this module, students will explore Lincoln and his assassination, participate in a small-group nonfiction book study, analyze primary sources related to the aftermath of Lincoln’s assassination, and use their findings to produce a coherent 5-paragraph essay determining Lincoln’s legacy both in his time and in the present. The module is designed to teach kids to use appropriate reference sources to interpret meaning and then construct a research paper supporting their assessment of Lincoln’s legacy. Throughout this teaching module, there are many suggestions about ways to differentiate this unit to make it accessible yet challenging for each student regardless of their ability level. Additionally, students will have the opportunity to participate in discussions with their peers and practice both speaking and listening skills. Since this is an extensive unit, it has been designed to address a variety of standards from multiple subject areas so as to make it more useful and relevant in a fifth-grade classroom. For settings where students change classes, the timing can still be adjusted to make it work in a social studies, reading, or writing class; teachers from different subjects can also collaborate and teach the unit across classes. 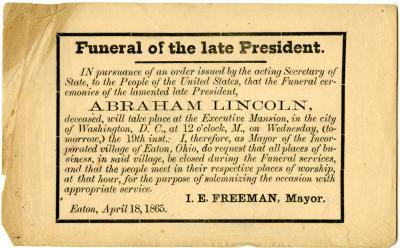 What impact did President Lincoln and his assassination have on the United States? 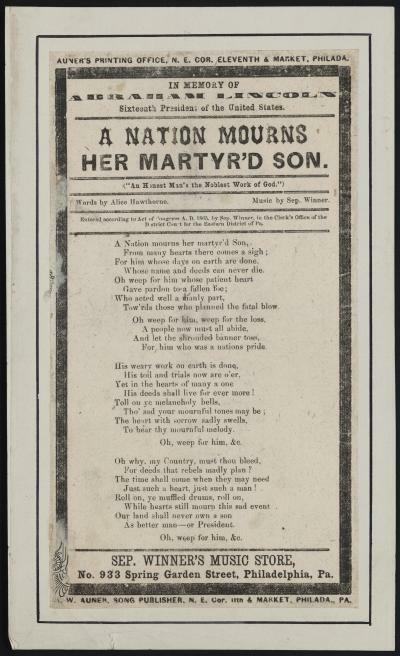 How can primary sources be used for research? How can research be presented in an essay/ oral presentation? Students will collect information about Lincoln’s life and legacy through a small-group book study. Students will analyze and interpret primary sources to draw conclusions about people’s assessment of Lincoln’s character. Students will create a five-paragraph research paper, including an introduction, conclusion, and analysis of three reference sources. Students will communicate Lincoln’s legacy through firsthand accounts of reactions to his assassination. Students will discuss Abraham Lincoln’s achievements and contributions to society both then and now. Students will understand and express Lincoln’s legacy and the impact he has had in the aftermath of his assassination. Students will see the importance of having access to primary sources of information. Students will develop an understanding of the components of a research paper. Students close read Pascal’s book, Who Was Abraham Lincoln? Students should independently create a K-W-L chat demonstrating what they already Know and what they Want to know about Abraham Lincoln. (Students will record what they Learn about Lincoln at the end of the lesson). Allow a few students to share something form their charts for the class. Why do we still have artifacts like the deringer today? Why do we keep such artifacts in a museum? What do you think the monument represents for our nations? Why do you think there are so many protests, vigils, and other important civic events held at Lincoln’s memorial? To support students with lower reading ability, read all written quotes and information aloud. To challenge gifted students, require them to directly reference the videos to support their opinions (ask as follow-up questions). Students write all letters of the alphabet down the left side of a piece of paper. Some letters can be removed at the teacher’s discretion. For each letter, students try to list as many words or phrases beginning with that letter which describe or relate to Lincoln’s life. This will be an on-going activity, so students do not need to fill in the entire brainstorm every day or in one sitting. To add challenge, students can think of multiple concepts for each letter. Students should read 3 sections of Who Was Abraham Lincoln? daily, taking turns reading aloud. Option 1: Students can be mixed together with gifted, average, and struggling students evenly dispersed throughout the groups, while the teacher circulates through the room, assisting as necessary. Gifted students can serve as group supervisors and strugglers benefit from the assistance of their higher-performing peers. This will work best if strugglers are comfortable (or capable of) either reading aloud or allowing other students to read to them. Option 2: High and average students can be grouped together and work more independently, while strugglers can work in a group with the teacher. This will work best with students with especially low reading and comprehension levels. For accountability, students in the independent groups should show their notes for each day’s work. High-achievers can challenge themselves to complete as many Post-it notes as possible in the time allotted. Students can choose a character trait Lincoln exhibits and construct support for chosen traits using examples from the text. Distribute copies of primary sources for students to reference throughout the lesson. Remind students that a primary source offers firsthand knowledge of an event, recorded by someone alive during that particular time period. This can include newspaper articles, journal entries, creative works, photographs, etc. Students will use an index card to write a 3-2-1 summary, including 3 elements a research paper should have, 2 places to get information, and 1 question they have about writing a research paper. Body paragraphs 1 and 2 (at least 5 – 7 sentences) should begin with a description of the reference source. Then analyze the meaning of a primary source and describe what the author reveals about Lincoln’s character through their depiction of the aftermath of Lincoln’s assassination. Cite reference sources.